Which figure has bigger area ? Which figure has bigger perimeter ? What is the width of the path if it’s same all around ? What is the area of the path if it’s same all around ? What is the area of the un shaded region ? What is the area of the shaded region ? Side of each square = 3 cm. What is the area of un shaded region ? 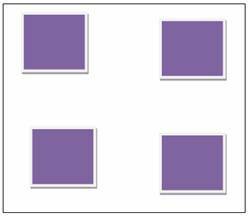 How many smaller square can be placed in the bigger square ? What is the area of non shaded region ?